To combat this trend and preserve the effectiveness of antibiotics, we must use them less, so that bacteria have less chance to develop immunity to them. Doctors and hospitals must use antibiotics more judiciously. However, some 70 percent of all medically important antibiotics2 sold in the United States are intended for use not in human medicine, but in animal agriculture.3 We must also drastically reduce use in animals, where antibiotics are often used to promote growth and prevent disease in industrial farming conditions. The nation’s fast food restaurant chains are in a unique position to address the antibiotic resistance crisis. Fast food chains are huge buyers of meat and poultry. A quarter of all chicken produced in the United States is sold through fast food restaurants, according to the National Chicken Council,4 and McDonald’s has been cited in the media as the largest buyer of beef in the United States.5 Fast food restaurants can demand that their suppliers reduce or eliminate antibiotic use in the production of the meat and poultry they purchase. A coalition of organizations, including Consumers Union, Center for Food Safety, Food Animals Concerns Trust, Friends of the Earth, Natural Resources Defense Council and U.S. Public Interest Research Group Education Fund, have called on the nation’s largest fast food and fast casual restaurant chains to adopt policies limiting antibiotic use in their supply chains. This third annual Chain Reaction Report assesses the restaurants’ progress. The 2017 Chain Reaction III Report and Scorecard ranks America’s 25 largest fast food and fast casual restaurant chains on their antibiotics policies.6 The goal of this effort is to help consumers make educated choices about the meat they eat, and encourage the largest chains in these industries to improve their sourcing policies. Our 2017 survey results indicate that increasingly, fast food companies are seeking to address the antibiotic resistance public health crisis by mandating changes in their supply chain. Fourteen of the top 25 companies, a clear majority, have taken at least some steps to limit use of antibiotics in all or some of their supply chains. These fourteen, accounting for two-thirds of all fast food industry revenue,7 received passing grades, up from nine last year and five the year before.8 The five companies that made a commitment for the first time this year are KFC, Burger King, Starbucks, Dunkin’ Donuts and Jack in the Box. KFC improved the most over last year, earning a “B-” compared to last year’s “F”, as a result of making a commitment to transition its entire product line, all chicken, to being raised without antibiotics important in human medicine by the end of 2018. 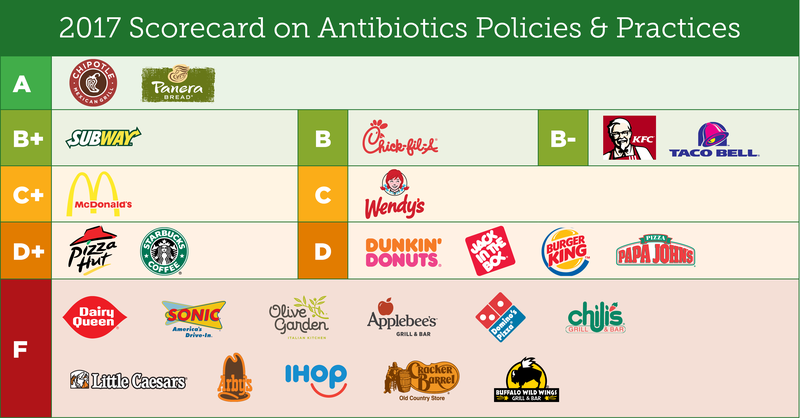 Chick-fil-A, Taco Bell, and Wendy’s have also progressed in implementing their antibiotics commitments in chicken, earning grades in the “B” and “C” range. McDonald’s earned a “C+” this year, the same grade as in 2016, when it announced that all the chicken it served in the U.S. was raised without medically important antibiotics. It made no new commitments on beef or pork, however. In August 2017 McDonald’s published a new “Vision on Antibiotic Stewardship” document that established ambitious goals for limiting use of medically important antibiotics in its entire global supply chain for all of its meats. But timebound policies for pork and beef have not been established under this new vision. In the long run, changes in the fast food marketplace alone will not stem the rising tide of antibiotic resistance. Ensuring consumers have more choice when it comes to purchasing meat and poultry raised without routine antibiotics use will not sufficiently address the broader risk of resistance from continued misuse of antibiotics in much of the meat industry. For that, we need government to set rules across the industry that prohibit the routine use of antibiotics in food animal production for growth promotion and disease prevention purposes, and set baseline standards that limit acceptable use to treatment of sick animals and to control a verified disease outbreak. (See Recommendations section). To date, government response to this major public health threat has been woefully inadequate. 2. ‘Medically important antibiotics’ or ‘antibiotics important to human medicine’ refers to antibiotics that are the same as, or similar to, classes of drugs used in human medicine. For example, the antibiotic tylosin, used in livestock, is a member of the medically important macrolide class of antibiotics. 6. Appendix 2 describes the scoring and grading methodology for this Scorecard. 9. “Routine antibiotic use” means use for growth promotion and/or in a regular or repeated pattern for disease prevention.